What are your favorite secret areas in the game. Places You just loved to visit, time and time again and marvel at how great it looked and how so little people would see it because it was hidden, out of the way, or locked behind a puzzle? I forgot about the starry vault in the dwarven puzzle dungeon. The Cerebro Room, for sure! Our guild used to celebrate officer meetings in that place. So, in my mind, it mix an awesome place with really amazing people. At the north of the asuran lab jumping puzzle. Was the one in Caledon changed recently? Because I've been there not long ago. There is a little camp with a cat high up in that dark corridor in Tangled Mess I love. On top of the mountain (outside regular map) in Thunderhead Peaks. Inside Gandara and the confetti bunker in/under Domain of Kourna (these are hilarious). Favorite area is the hidden garden JP. If it's not daily. It's just so peaceful and pretty. Roleplaying as Hannibal lector in the "secret not so secret" small cave inside of dredge on EB ( wvw ) with the water part below it where you can knock people in which afterwards they cannot even port to spawn since theyre in perm combat mode and cannot get out.The dev that made this cave is my hero. Inside the metal head of the bird in Crown Pavillion (Divinity's Reach). During wintersday, when you sit on top and watch down, you can see the snow falling. Looks pretty nice. 50-60 % of Aurora's Remains (Brisban Wildlands). 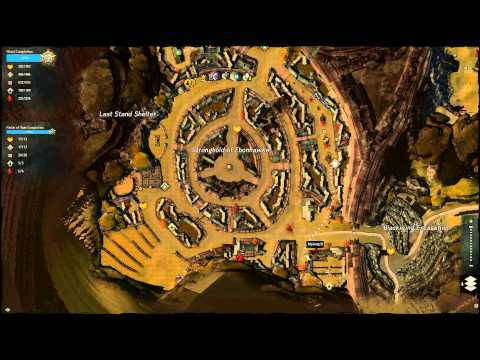 ANet did make this zone a little less special, by tying some collections to the areas meta-event, but the majority of players forget this place the instant the task is done. To add insult to injury, I noticed that almost no player collects the bonus chest, although the path to reach it is lit with light-orbs (step by step). The giant corpse with the skritt dancing around in Silverwastes. Before the mount-age it was pretty tough getting there, but not impossible. I still ponder about the reference to this one. Any ideas? Secret Cat Room in Crystal Oasis. The room with the three small Anomalies (replicas of the real boss on top of the area) Dzasha Uplands. The entire area can be considered a secret, since it is the largest Jumping Puzzle in Path of Fire, which even works with mounts. A lot of people still claim that you cannot make Jumping Puzzles with mounts around. This place is the proof that this is not the case. But on the other hand, the final boss on top of it is tied to an achievement. If you intend to go there, bring some friends. The thing is not difficult, but has almost a raid-boss hp pool. So if you try to solo it, you will be stuck for some time. Order of Whispers base in Lonar's Pass. Not many players have been there until today. This is the same map with the infamous Griffonrook Run Jumping Puzzle (yesterday's daily JP). People often ask "how the hell am I supposed to find that entrance?" Inside the Order of Whispers secret base is an NPC that directs you to it. But for some weird reason GRR is more popular nowadays. The giant undewater cave in Blazeridge Steppes, accessible at the end of the Behem Gauntlet Jumping Puzzle. Just dive into the pool, get to the place with the veteran shark and search one of the walls for a hole. It is a pretty nice cave that exists since launch. Rumors say it is tied to a guild trek location by now, but I was not lucky enough to prove this correct. The unused area in Bloodstone Fen, behind the raid portal. Easy to access with a springer, it is also possible with the glider. The Ooze boss in Citadel of Flame Exploration Path 1. Yeah, the good old brain-afk goldfarm path. It has a hidden boss, ignored by thousands of farmers over years. Why? In terms of efficiency, it is quite time-consuming to get there. The loot is not that good and the boss has some pretty nasty mechanics. If you fight too close to the edge of the platform, he can push you down = wipe XD. Fighting it in a large group is easy. Alone or with two people, it can be challenging. Fighting the Ghosts in any Ascalonian Catacombs Exploration Path. After the intro and you picked the tasks, 100% of all players just rush down the stairs, mostly skip the gravelings and head straight to the spider. This is still a secret, thanks to the speed-run mentality of this community XD. Instead of the brain-afk method, you go down the stairs normally, kill the gravelings and turn around. You will notice that there is a path backwards. Step through the open gate and you get into a very tiny room with nothing in there, but a torch on the wall. Touch the torch and enjoy. The loot room in Only Zuhl Jumping Puzzle (Timberline Falls). When descending the giant hole with the flamethrowers, there is a crack in one of the walls with a small bonus chest. However this thing is double-trapped. If the destroyer does not kill you, the chest will. The bunny cave in Timberline Falls south-west of the Valance Tutory Waypoint. What players do in this cave? Get in, kill the grawl and get out. Get in, loot the Splendid Chest and get out. What else is there? Next to the chest is a white rabbit sitting, if you watch it for some time, you will notice a demonic green flash around it. If you wait a little longer and hide somewhere, you will notice that the grawl worship the rabbit. Grawls normally worship statues, which cannot move. But hey, it is just an ordinary rabbit, what could go wrong? The giant tree above Firebreak Fort Waypoint in Mount Maelstrom. It was possible to get to the top without mounts, but it took ages. The view is awesome and it is a perfect spot to start a Griffon Flight. The mini Jumping Puzzle north-west of Junction Camp Waypoint in Harathi Hinterlands. It is known by a few treasure hunters, but most people have never been there yet. I don't have a favorite (yet), but I did realize something relating to this just yesterday. I decided to try and finish up some of the Explorer achievements, and while doing so discovered, even after playing this game for almost 2 years straight now, some places I didn't even know existed. That's one of the things I love about this game......2 years and STILL seeing "new" places. I always find it difficult to remember examples when a topic like this comes up. I know there's little spots all over Tyria which are out of the way and don't seem to serve any purpose, but are always worth visiting. But trying to remember them to list is difficult. But here's some I can think of. The bamboo garden in the Grove is a personal favourite, both because it's pretty and because it's the first 'hidden' location I found. Although these days it's often being used by role players so I feel like I'm intruding if I'm there too long. It's not exactly secret since the Yellow Catmander is in there but the quaggan cavern in the desert Borderlands is great. There's so much going on in there, I wish you could talk to more of the characters. Oh and the djinn castle above Desert Highlands is amazing. I loved finding my way up there too. I knew it was there and that you could get up there, but I never heard how so it was a nice surprise when I went through a random portal and found myself on the path. There's lots of little corners I like visiting just for the detail put into it, like the inn in the Ossan quarter in Divinity's Reach, inside the Windmill in Queensdale, the upper levels and back rooms of the various Spirit Lodges in Hoelbrak and the bar in the Grove. Oh and the back alleys of new Lion's Arch. I know people complain about it but as soon as you get away from the central bank/TP/crafting area and into the streets the whole feel of the place changes and it reminds me of all kinds of real sea side towns I've visited. None of these places are difficult to find of course, but there's also very rarely a reason to go there, so suspect a lot of people don't see them often, or at all. The half way point in the under water tunnel where, if you surface, there is the insulting quaggan. Don't remember map (never do), but its lead to me trying to surface anytime I'm in long under water caverns to try and find him again. Here you go. Go pay him a visit, he has some overdue insults for you. Not secret but the mid layers of gilded hollow guild hall. Really nicely crafted by the dev who worked on that hall. I have a lovely place where I like to go even if I don't complete it: Vexa's Lab in Fireheart rise, it's a jewel: A stunning lab regrouping several environments from aquarium to lava falls, always a pleasure to wander around here, a pure masterpiece of asuran architecture/ lab design. It's one of the most amazing-looking spots in the game and it's especially fun because it's locked behind a not-really-that-hard puzzle. hanging out on the big jellyfish thing in la can be fun. pretty easy to get to now with mounts. I loved that puzzle. It took me several evenings to get through it all but it was worth it just for the variety and figuring out what came next, and the starry room was definitely the best. The hardest part about it was convincing myself I should jump down there. Which is very strange for me because that's exactly the kind of thing I normally do in games and in fact my first thought was "Wow, that's a big hole, I wonder what happens if I jump down there?" but I was trying to complete the puzzle/min dungeon/whatever that place is without getting too distracted or getting stuck and having to start over from the entrance so I spent a while confirming that really was the only option and therefore jumping down there was probably intended. I don't know what I expected when I finally launched myself into the abyss but it definitely wasn't that. Oh! The secret Turkey room in Ascalon Catacombs. Sometimes the abyss lunches itself on you. There's nothing lore breaking about coming back from the dead. It's happened to different people in several different ways, including the player character in both GW1 (some of us more frequently than others) and GW2. She's been dead much longer than most people who get resurrected, and the fact that her body is probably either gone or not in any state she'd want to inhabit it might be a problem, but there might be ways around that. Seriously though I think the best we can hope for is more appearances from her as a ghost. Ohhhh, I had totally forgotten about that one! The one with the hidden dancing achievement, right? It is not under the Grove but on the same level as the bottom level. It can still be accessed. That could easily be my favorite. It's so cool! But the secret garden in the Grove is also a close candidate; I wish all of the Grove looked pretty like that instead of the cheesy bluish, glittering design they picked. I also love the closed off Halloween area within the Ascalonian Catacombs, at the Black Citadel, leading down to the tomb. And I must ask: Where is that?! Blazeridge Steppes - The water area near the Behem Gauntlet JP with the underwater areas. Theres a trek spot indeed, I've done it before! LA - All the story instances in there because old LA. Draconis Mons - everything. And the JP. The pirate cave near LA, still. Ascalonian catacombs, after the ghost eater go up the stairs and see the vacant room that could have been another dungeon path. The Scrum meeting with the Skritt in the Silverwastes. Super Adventure Box toxic falls area World 1 Zone 3. OMG, yes. That moment was just jaw-dropping. Yes, I started with Prophecies, and I did the Gwen thing. Then later on a different character, I dug through the tunnels under Kamadan and stomped through the mountains outside Boreal Station, and there was this huge building, and I descended to the bottom of it. And this woman comes out and describes who's in charge of the building, and finishes, "I'm Gwen." There's a permanent dent in my floor where my jaw hit it. My favorite place is the extra room behind the final bosses of Ascalonian Catacombs paths 1 and 3. Looks really cool with the platforms that aren't all there. oh! he has a name? I wondered why a t-pose model was there. Also as I've broken every map in game, I have too many places to count, I especially like my wvw hiding places for dorking off, but the inner vault of the gilded hollow is my latest break "still unsure why the door was never openable". I managed to get under the crystal chamber platform but not quite into that chamber. When running around the mine in Windswept Haven, I found a secret fake wall that led further into a mine that I have never noticed before. Maybe others have, but there is indeed a fake wall there you can walk through. It's not a lot to look at, but it's a fun little surprise! The secret garden in the Grove. Its just beautiful. If you get under windswept at night, thought, the stars come out and its like swimming through the universe. I decorated two robots having a date behind those doors. Was able to put in the teleporting mirrors in there so now we can visit it anytime we want.